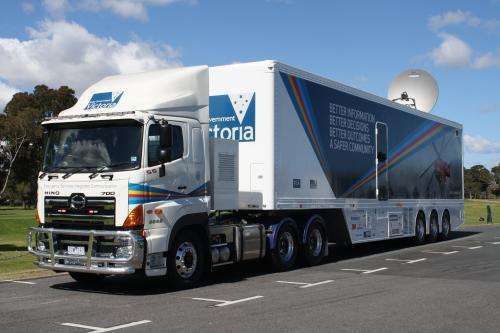 The National Saftey Agency vehicle provides emergency services personnel at the scene and in the command centre with access to the right information at the right time to improve the coordination of operations during disasters such as bushfires. Australia's key disaster management agencies have joined forces to tackle the problem of how to access and interpret information gathered during bushfires, and other natural disasters to help emergency services save lives and property. "Currently, there are many ways emergency services and the community accesses official, crowd sourced and social media information during natural disasters," CSIRO's Digital Productivity and Services Flagship Research Leader Alan Dormer said. "There is a real need for a united approach to help bring all of this information together in a way that makes it easier to understand, and make quick and informed decisions on how to respond to minimise the risk to life and property." During the two-day Building a System of Systems for Disaster Management event key agencies from across the country will look at how they currently access vital information during emergencies, and how they can work together to improve on their systems for future benefit. "Our aim is to develop a joint statement and plan of attack on how to address the research and information concerns that restrict our ability to achieve full situational awareness during a disaster at a national scale," Mr Dormer said. "Technology has a major part to play in this, and we are working together to find solutions to big information gathering and sharing challenges faced by emergency services during natural disasters." Emergency services, such as the NSW Rural Fire Service, are already using some technologies, like the CSIRO-developed Emergency Situation Awareness (ESA), to supplement information from other sources. "Minimising the time for communication and integration of this information frees up time for discussion, considering options and results in faster and better decisions," Mr Dormer said. "Having this information in an accessible form also enables incidents to be replayed and reviewed so that we can learn and respond better next time. "This discussion is just the beginning and we hope to form a core working group of national agencies and organisations which will meet regularly to work toward the development of a high-level architecture of the system of systems, linking industry best practise and collaboration pathways to support situation awareness and community resilience." CSIRO is also working on a suite of information based tools for disaster management including, predictive modelling of floods, bushfires and tsunamis, risk analysis, support tools for community resilience and apps for disaster recovery.